The old Immanuel Lutheran Church was built in 1916. The interior had been decorated by C. A. Christensen, church artist of Milwaukee. The church was organized in 1914 and services were first held in the Christian Church which they rented. The first officers were: elders, John Osterman, Gustav Grassman, George Rustman; secretary, Otto Klatt; and treasurer, August May. On May 1, 1916, construction was started on the church. Rev. Fred Seifert of Benson was the first pastor and divided his time between the Benson church and the Minonk church. Rev. F. C. Huber was the first full-time resident pastor. In 1947 a parsonage was built on an adjoining lot to the east of the church. The last service was held in the church on March 17, 1963. 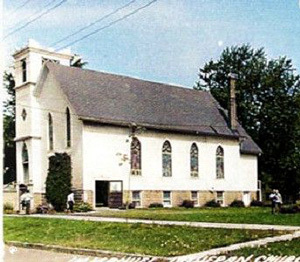 Shortly after it was demolished and replaced with the present church to meet the additional space required of the growing congregation.